Get a free online quote in under 2 minutes! When it comes to our office removal service, Top Removals is a name synonymous with excellence. Our office relocation services are truly unrivaled and have been specifically tailored to suit all manner of requirements, ensuring the entire process is stress-free, leaving you free to focus your time on the finer details of your move. London office relocation requires more consideration than other types of moving for numerous reasons. Top Removals will consider the all-important details so you don’t have to. We ensure the downtime to your business is kept minimal and plan ahead to ensure minimal stress on the day. Our specially trained team will work hard to ensure your office is relocated on time and within budget. Unlike other removal companies, we do not have hidden fees or charge extras for weekend call outs or out of hours requests. We are proud to be accredited members of the National Guild of Removers and Storers, so you may rest assured your all important items are in the most capable of hands. Why Should You Choose Top Office Removals? We exact the highest standards in all our work and our moving team has years of professional experience all successfully gathered across numerous office removal and relocation projects. We take the greatest pride in all we do and handle your goods with the utmost care and caution. If you have to move from your office before you have found a new one, we offer a comprehensive and secure storage service. Our premises in London utilise cutting edge CCTV and are always patrolled by security staff to offer you the ultimate peace of mind and protection. What Is Included in Our London Office Relocation Services? After your enquiry is submitted, a member of our team will make an appointment with a surveyor who will attend the premises and estimate all resources needed. We survey the location, parking facilities, access to and from the buildings, number of staff to be relocated, IT removals and migration requirements, crates hire, need of a packing service and packing materials, overall volume and whether dismantling and reassembling is needed. 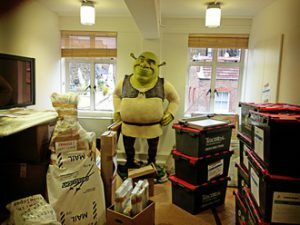 Then the complexity of the move is evaluated and we can provide you with a competitive quote to include a breakdown of all rates for your upcoming office removals in London. We do not have hidden charges and all our fees are explained thoroughly. Once your quote for your office move in London is accepted you will be appointed with an office moving coordinator who will be your single point of contact throughout the office relocation process and beyond. Your coordinator will be responsible to manage the different teams involved and plan the stages of your office move. Depending on the complexity, we can plan the move to take place over the weekend and on different stages in order to minimise the disruption of your business process. For example, we can first arrange crates delivered well in advance, then on the moving day an IT speacialists team can disconnect all the IT equipment and label it. It can be moved first and connected directly at the new address. Meanwhile, your coordinator will have the handymen crew who will dismantle and wrap the furniture. 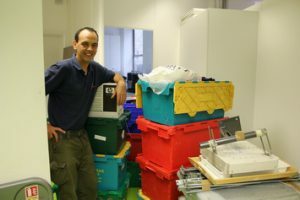 Finally, our London office removals team can load and deliver all crates, furniture and IT and place it at the new address according to the layout plan provided. All furniture will be reassembled and debris removed. Each office relocation is planned separately and is unique. If you wish to discuss your office removal project, please do not hesitate to get in touch and one member of our team will be delighted to assist. Alternatively please do not hesitate to fill out our ‘book a service’ form below and we will be in touch to help with your enquiry.